Flanked by volcanoes and colorful Maya villages, Guatemala's Atitlan is one of the most striking lakes in the world, and there are few better places to lap up the views than Laguna Lodge, a 10-minute boat ride  but a world away  from the Western Highlands tourist town Panajachel. Hewn from a mixture of volcanic stone, wood and palm, the property is as much a showcase for indigenous crafts as it is a sanctuary for conscientious globe-trotters. Local adobe art adorns the walls of its seven suites (priced from $225 a night), bed runners are woven by the women of a nearby village, and furnishings are antique and hand-carved. Conservation measures are laudably thorough: materials are recycled or derived from sustainable sources, hot water is solar-powered, energy-saving devices are used and community projects supported. The cuisine served in the Zotz restaurant is vegetarian  and inventive enough to appease the most ardent of carnivores, with ingredients sourced either from the on-site gardens or local farmers. If that all sounds too earnest, it isn't really. Loafing is judiciously encouraged with a strategic scattering of hammocks, books and board games among the various sundecks and thatched-roofed palapas (pavilions), and massages are ministered en suite. If you're feeling active, a cornucopia of outdoor pursuits and cultural jaunts to indigenous villages and coffee plantations await. The ace up Laguna's sleeve, however, is its own 100-acre (40 hectare) nature reserve. Rising from the lake edge up through large cliffs to ancient ceremonial rocks and tropical dry forest, it's pure Maya magic. 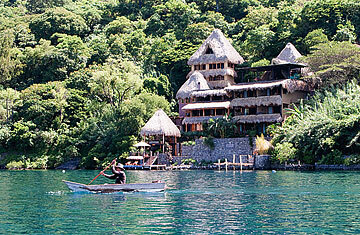 See www.lagunalodgeatitlan.com.